Sunday Pets are a New Zealand company who defy the norm by producing foods which are slow baked instead of incinerated in a kibble extruder. 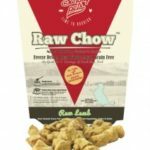 Their Raw Chow range goes one step further as a freeze dried food, which means almost all the nutrition stays intact. I’m an advocated for freeze dried foods so it’s great to see a few of these foods emerging (also check out Frontier Pets, Balanced Life, and K9 Natural). This food is 89% minimum lamb and lamb off-cuts. That’s great to see, especially considering a dog’s native diet would mostly consist of meat. This is inclusive of bone, blood, liver, kidney, and heart, which provide a range of essential nutrients necessary in a raw diet. Next we have a range of decent vegetables and fruits. That’s not all, as we have a few really nice inclusions – the excellent green lipped mussel for joint health, manuka honey which has anti-bacterial properties, and kelp which has a number of health benefits including arthritis and tooth decay prevention and a boost to the glandular system. As a compositional whole my only concern is the food is very high in fat. Dog’s digest animal fats far more efficiently than we do, so it’s not that bad a thing unless your dog suffers a condition like pancreatitis. I feel Balanced Life and Frontier Pets have a slightly better composition, but this is still a very good food. Fresh Lamb(min 89%) including Meat, Bone, Blood, Liver. Kidney, Heart. Vegetables(min 9%) including Carrot, Squash, Sweet Potato, Celery. Fruits(min 0.2%) including Apple, Blueberry. Egg(min 0.1%), Manuka Honey(min 0.07%), Green Lip Mussel(min 0.07%), Kelp(min 0.07%), Flaxseed(min 0.07%), Fennel(min 0.04%). Nutritional Additives: Vitamins- Vitamin A 15 kIU/kg, Vitamin D3 2 kIU/kg, Vitamin E 400 IU/kg, Vitamin B12 0.5 mg/kg, Thiamine (Vitamin B1) 50mg/kg. Riboflavin (Vitamin B2) 45 mg/kg, Niacin 450 mg/kg, Pantothenic Acid (Vitamin B5) 50 mg/kg, Pyridoxine (Vitamin B6) 38 mg/kg, Biotin 1 mg/kg, Folic Acid 5.2 mg/kg, Choline 2700 mg/kg Ascorbic Acid 55 mg/kg. Minerals- Magnesium 0.1%, Manganese 27 mg/kg, Cobalt 0.47 mg/kg, Selenium 0.9 mg/kg, Iron 240 mg/kg, Zinc 200 mg/kg, Copper 26 mg/kg, Iodine 1.8 mg/kg.